Investors cheated while participating in financial pyramids should be “taught how to use their money,” but the government shouldn’t bear responsibility for their losses, Prime Minister Dmitry Medvedev said Monday. Medvedev slammed those caught in the prominent MMM pyramid, founded by Sergei Mavrodi, who shut down the scheme last month just to launch a new one. “If a person acts ridiculously, as in the case of MMM — the same thing three times — it’s a problem with their brains,” Medvedev said at a meeting with United Russia leaders in Vladivostok, Interfax reported. “One mustn’t gamble on MMM three times in a row. … Why should the government be responsible for this?” said Medvedev, the leader of the United Russia party. Mavrodi, who served 4 1/2 years in prison for defrauding an estimated 10 million to 15 million Russians in the mid-1990s, announced in June that he had to shut down the MMM-2011 pyramid scheme he launched last year, but he said that he started MMM-2012 to cover the losses investors incurred in the previous scheme. 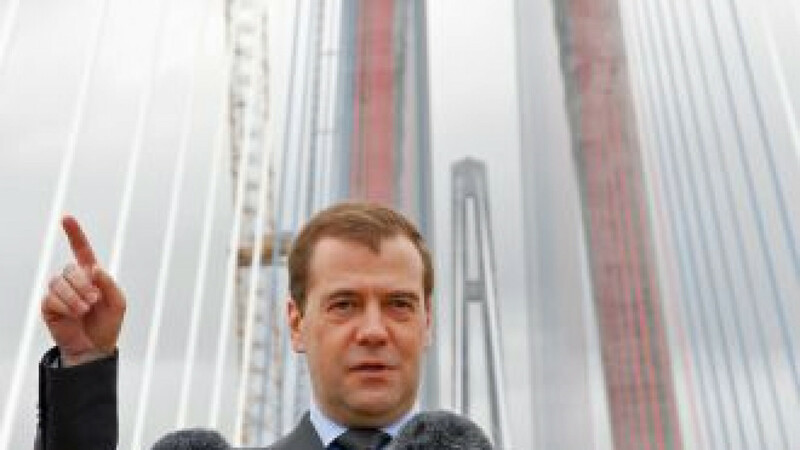 Medvedev, who earlier that day opened the bridge to Russky Island built ahead of the summit, said building quality transportation infrastructure is crucial for developing the remote Far East region, where many settlements are connected with each other only by air. One possible measure to achieve this, he said, is developing small aviation and starting domestic manufacturing of aircraft with small passenger capacity. Until production is launched, import duties for civil jets with a passenger capacity of up to 72 seats could be lifted, Medvedev said at a meeting on developing the Far East region. Some participants in the meeting said privatization of the region’s largest airports — such as those in Petropavlovsk-Kamchatsky, Yuzhno-Sakhalinsk and Magadan — could facilitate the modernization effort. “It’s good that at least someone supports the government’s privatization plan,” Medvedev said. Heads of the biggest companies — like Russian Railways and VTB, whose stakes are due to be offered to the market as part of the government’s sell-off program through 2018 — expressed their concerns about the plan at the St. Petersburg International Economic Forum last month.